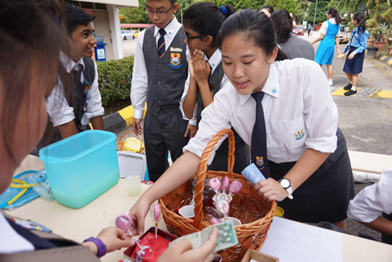 Pusat Sumber SMK Bandar Utama Damansara (3): Friendship Week Sales 2017: The Librarians' Perspective! 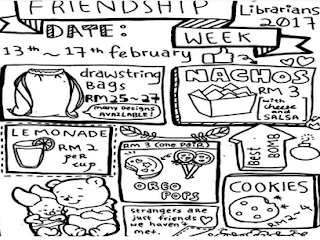 Friendship Week Sales 2017: The Librarians' Perspective! 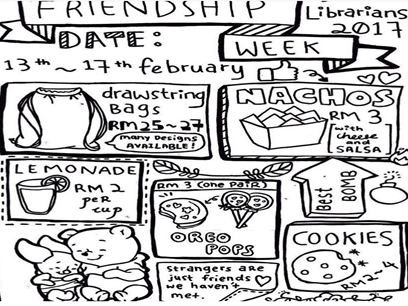 From the 13th to the 17th of February, the Librarians has a sale for Friendship Week - a step up from the Friendship Day sales from years past. Many people were exited because we sold interesting things, such as drawstring bags, lemonade, cookies, Oreo pops and nachos. 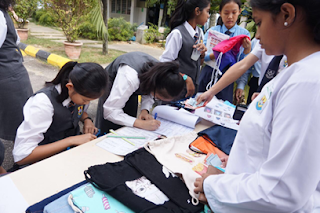 They were sold at reasonable prices such as RM2 for a cup of lemonade, RM25-27 for a drawstring bag and RM3 for nachos. Our nachos, lemonade, cookies and drawstring bags were a hit. They sold like hotcakes! For the drawstring bags there were many designs ranging from simple ombre to cute graphics of food and flowers and ombre. Everyday, our products sold out and we generated a great amount of revenue. In the end we made a huge profit and that money went towards our Annual Librarian Dinner.Personally, I am grateful to be a part of the Librarian sales team for Friendship Week because I got experience in sales management.